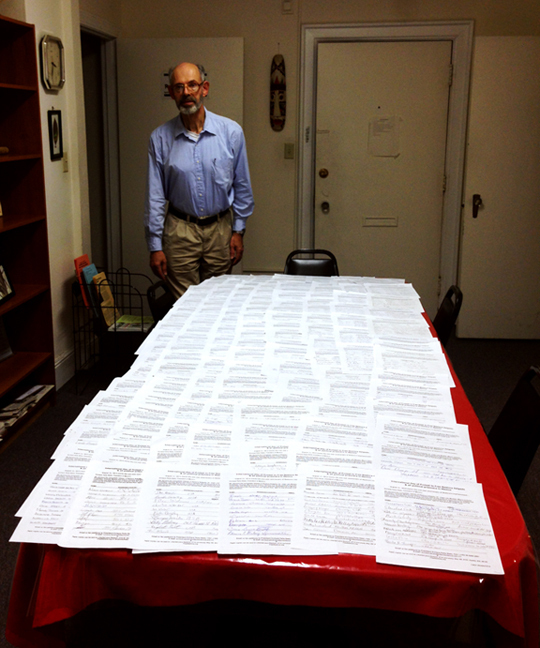 Fred Hyde stands with the many pages of signatures provided in support of Nestora. Shown with the petitions is Fred Hyde, who wrote the cover letter shown below on behalf of the campaign. A pesar del gran apoyo el 21 de agosto del año presente, ganar la libertad para Nestora y sus compañeros aún queda por delante de nosotros. El 21 de agosto marcó el primer aniversario de la encarcelación de Nestora Salgado en una prisión federal en Tepic, Nayarit. Con su apoyo, el movimiento para liberar a Nestora y a otros presos políticos en México ha crecido internacionalmente, pero la victoria sigue siendo difícil de alcanzar. 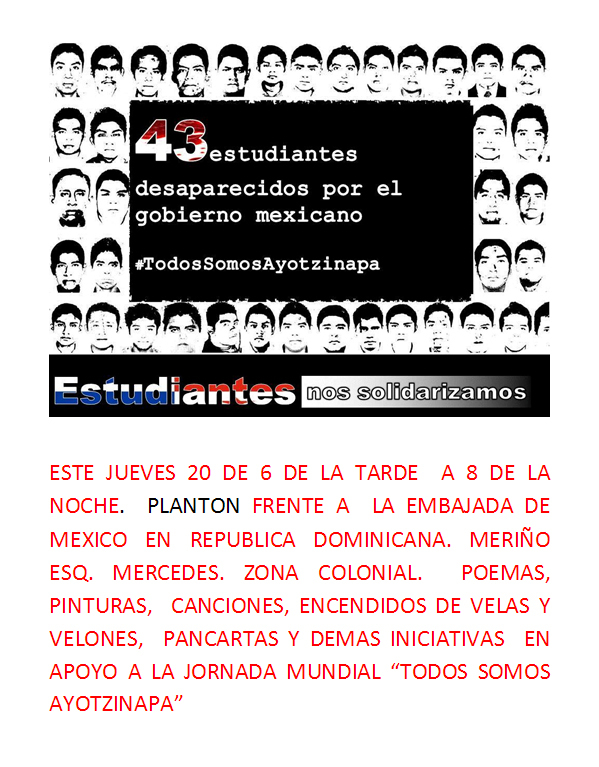 La masacre el 26 de septiembre en Guerrero de cerca de 50 estudiantes, en un ataque coordinado por la policía y los criminales, es una prueba más de que tenemos nuestro trabajo por nosotros. Estos asesinatos han llamado la atención internacional sobre la corrupción de las figuras que son responsables de tener a Nestora tras las rejas: el gobernador de Guerrero, Ángel Aguirre, quien se niega a liberar a Nestora a pesar de la orden de un juez federal, y el Presidente Peña Nieto quien ha presidido el encarcelamiento de cientos de hombres y mujeres que se han levantado en contra de la violencia y la corrupción en otros estados y ciudades. familias de clase obrera de otros presos en Guerrero y los enormes costos asociados con la representación legal de Nestora. Cuánto podemos lograr depende de viejos partidarios de Nestora como usted. An editorial was posted to Seattle Times after North Korea released a U.S. prisoner. The Seattle Times Editorial Board asked for the release of Kenneth Bae, who has been imprisoned in North Korea for over 2 years. Here, Fred Hyde writes a letter to the editors to also consider asking for Nestora’s release. Regarding your Friday, September 24 editorial on Kenneth Bae, a U.S. citizen imprisoned in North Korea, there is another U.S. citizen who is suffering harsh prison conditions in another country and deserves to be released. Nestora Salgado, a resident of Renton, is a political prisoner in Mexico. In 2013, residents of her home town of Olinalá, Guerrero, elected her coordinator of their legally authorized community police force. Local and state officials conspired to jail this brave indigenous leader for carrying out her duties in an honest, principled manner that exposed their corruption. They have kept her locked up for over a year despite a March federal court ruling declaring her innocent and ordering her release. The international campaign to free her has the support of eight members of the Washington congressional delegation and many groups and individuals. Mass protests over the disappearance and probable murder of 43 activist college students by police and drug cartel thugs in Guerrero drove the state’s Governor out of office last week­the same person responsible for Salgado’s arrest and ongoing detention. The time is now for President Obama to call Mexican President Peña Nieto and insist he free Salgado immediately–before she too is disappeared. August 21 marked the one-year anniversary of Nestora Salgado’s incarceration in federal prison at Tepic, Nayarit. With your support, the movement to free Nestora and other political prisoners in Mexico has grown internationally over this time, but victory is still elusive. The September massacre in Guerrero of nearly 50 students, in a coordinated attack by police and criminals, is further evidence that we have our work cut out for us. These murders have drawn international attention to the corruption of the political figures most responsible for keeping Nestora behind bars: Guerrero governor Ángel Aguirre, who refuses to release her despite the order of a federal judge, and President Peña Nieto who has presided over the incarceration of hundreds of men and women who have stood up against similar violence and corruption in other Mexican towns and states. To keep this campaign alive and growing, we need your continued financialsupport. Your contribution will be used to expand public outreach, aid the working class families of other Guerrero prisoners and the enormous costs associated with Nestora’s legal representation. How much we can accomplish depends on you—Nestora’s longtime supporters.